If scenic views and privacy are at the top of your list, then I have an amazing home to show you. This Breckenridge single family residence has mountainside access and stunning views of the 10 Mile Range. 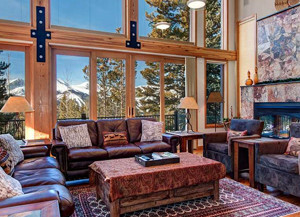 In fact, the wall of windows on the main level offers breathtaking views of many of the peaks that make Breckenridge so special. An open floor plan on the main level accentuates the square footage. The master bedroom includes his-and-hers closets, a walk-in shower, stylish fireplace and enough room to relax as well as sleep. Other features include a media room, wet bar and even a landscaped patio with a fire pit. All of these amenities add up to the perfect mix of luxury and warmth that’s close to all of the conveniences in downtown Breckenridge. Experience the natural surroundings, the views and live only minutes from Breckenridge’s local shops and restaurants. Whether you are looking for a primary home, vacation property or rental income, this real estate will certainly hold up its end of the bargain. I’m proud to feature it this month and hope to show it to you soon! As you can tell, this fabulous home in Breckenridge has a long list of qualities that make it head and shoulders above other homes on the market. If you’re interested in this property, get in touch to schedule a showing. I can assure you that many of the features should really be seen in person. The wall of windows on the main floor is the type of feature that pictures really can’t do justice to. If you’re not quite ready for showings, but you’re looking for a home Summit County, I’m happy to put together some MLS listings that might meet your needs, and of course, you’re always welcome to look through the updated MLS listings on my website at any time. When you’re ready to discuss your options or prepare for showings, contact me at any time via email ([email protected]) or on my office line. I look forward to working with you to find your perfect home.